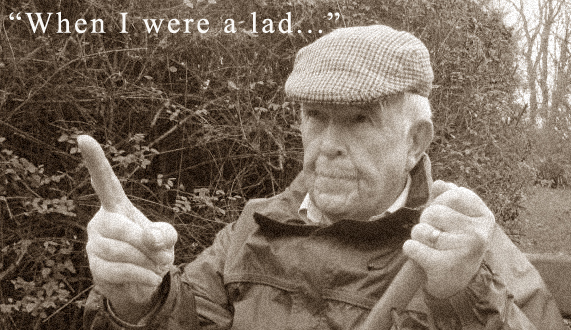 … People saying “when I were a lad, you could buy a three piece suit for £20 ”. (Only in those days, they used to say “when I were a lad, you could buy a suit for 10/6”). … People saying “when I were a lad, summers were definitely hotter, and we used to get snow every Christmas” (Actually, it just rained a lot, then too). … People saying “When I were a lad, you were much safer on the streets.” (Actually, the number of violent deaths per capita in the UK has fallen). … People saying “School kids always look such a mess nowadays”. (No – we looked a mess then too). well, this is what Socrates had to say on the matter – “Our youth now love luxury. They have bad manners, contempt for authority; they show disrespect for their elders and love chatter in place of exercise; they no longer rise when elders enter the room; they contradict their parents, chatter before company; gobble up their food and tyrannize their teachers.” He was born somewhere around 470 BC. Yep… the more things change, the more they stay the same. We would like to thank our very good and, actually, very uncurmudgeonly friend, Mr Phil Stick, for posing for our photograph. Couldn’t have done it better ourselves…..